Please sign in (at the top of the page) or Register to view content of page. Welcome! 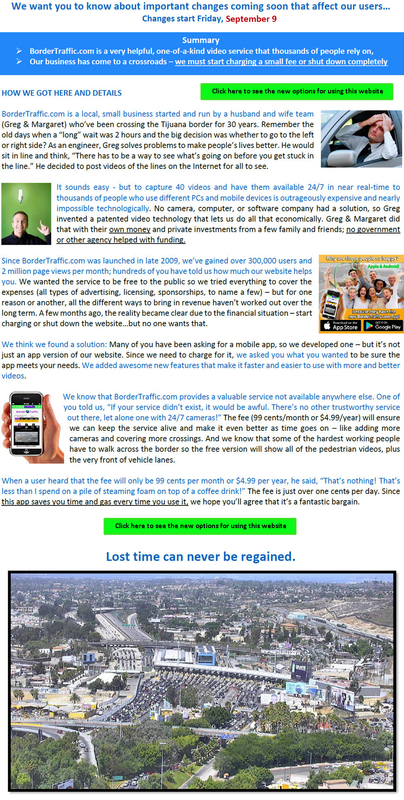 We’ll get you set up on BorderTraffic.com in a few easy steps. First, decide whether you want a Free Standard Membership or a VIP Membership. Standard Membership allows you to view everything on our site except video of the Sentri/Fast/Nexus lanes. As a Standard Member, you can click on any of the border crossing links and view video clips or text updates for that particular location. Video will be added for more VIP lanes in the future. If we currently don’t have video for your crossing, please check back for updates. Each VIP member is allotted 40 VIP views per day. A counter displays the number of views used that day. In the unlikely event that a user reaches 40 views in a day, VIP lane video access will be suspended until the following day. Standard video and all text reports will still be available. The VIP Membership costs just $6.99 per month and is easily set up to automatically renew without further effort on your part. The fee pays for itself many times over through savings of time, gasoline, frustration, etc. Business and Family Plans are also available for groups of five, ten, or more members. In Person at Our Payment Center – You can set up your account on our site and then visit our payment center to activate your VIP access. You’ll have 10 days to decide if VIP Membership is a good investment for you. During the free trial, you’ll enjoy full access to video of Sentri, Fast, or Nexus lanes at select border crossings, as well as all other information available at BorderTraffic.com. 1. Take your Customer ID number to our retail outlet, AmigoMexInsurance, in San Ysidro (address below) where you may pay by cash or credit card. Your VIP membership will be activated immediately and you’ll be given a receipt. 2. Please note - you’ll have 30 days to activate your membership and cash payments require a six-month or one-year subscription. For larger plans or customization, contact us for assistance.